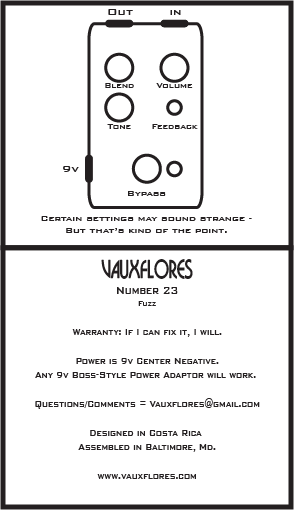 Introducing the new VauxFlores Number 23 – a fuzz-centric buzz-box with just a splash of upper octave cream and heterodyned, atonal artifacts with a sound few compare to. Designed in San José, Costa Rica, each box is hand-built to exacting specifications intended to please critical players and art-jammers alike. Top-mounted jacks and compact enclosure to accommodate even the most-cramped pedalboards. A traditional volume control with an added boost to the top end. Artwork derived from my Bioprinting I piece, making it the first effect pedal to feature artwork created by amplified earthworms. This particular pedal was retired from production in October 2018, but if you really, really, really must have one, please drop me a line and I’ll see what I can dream up for you. Or you can possibly find one via merch table or workshop. An milder example on guitar. For this example, the tone knob is dialed almost all the way down and the blend knob is at around 75% wet. The guitar used is an early-80’s Guild Telecaster with single-coil EMG pickups, run into a ZT Lunchbox amplifier. The recording was taken from the line out of the amplifier, with no post-processing applied to it other than an aesthetic fade in at the beginning of the recording. An heavier example on guitar. For this example, the tone knob is dialed almost all the way up and the blend knob is fully wet. An extremely heavy example on guitar. For this example, the tone knob is dialed almost all the way up and the feedback switch is engaged. A heavy example on bass. For this example, the tone knob is dialed all the way up and the effect is running 100% wet. I’m using a early-90’s Fender Jazz Bass, run into a GK MicroBass amplifier. The recording was taken from the line out of the amplifier, with no post-processing applied after the fact. Another heavy example of VauxFlores Number 23 on bass. For this example, the tone knob is dialed all the way up and the feedback switch is engaged. For all that are curious, the status LED for this edition of Number 23 is white. A review from the god folks at Guitar Moderne. And here’s one from Pedal of the Day.